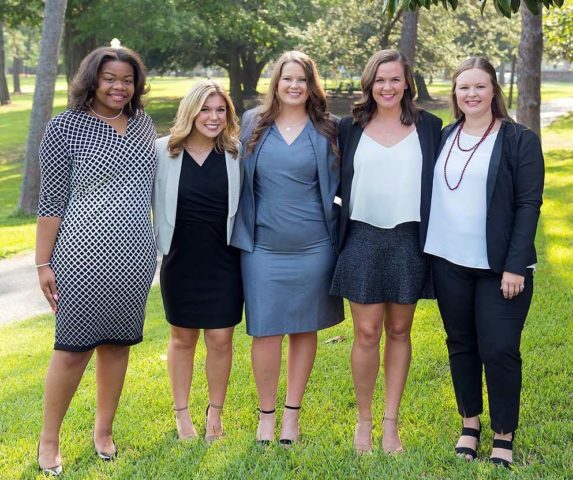 2018–2019 SGA Executive Council: L-R, Justala Simpson, director of public relations; Sidney Carol Hall, treasurer; Savannah Gibbs, president; Virginia Gaston, vice president; and Jordan Fleming, secretary. Founded in 1914, the Student Government Association has a long tradition of serving the student body. The purpose of the Student Government Association (SGA) is to advocate students’ rights; to facilitate communication between administration, faculty, and the student body; to promote the qualities of justice, leadership, and integrity; and to better the Huntingdon College community and the Montgomery community in which we live. SGA is comprised of the Executive Board and the Senate, and overseas the class officers and class events. All registered clubs and organizations are welcome to become members of the SGA’s President’s Council. The President’s Council serves as a roundtable council in which student organizations stay connected to the SGA and to the Huntingdon community. The Campus Activities Board (CAB) provides and coordinates student entertainment, activities, and programming for the Huntingdon student body. The Board is selected through an interview and application process at the end of the fall semester and reports to the director of student activities. Members serve for the calendar year, from January through December. CAB plans events such as Welcome Back Week, the Countess of Huntingdon Ball, the Miss Huntingdon Pageant, and much more. The Freshman Leadership Initiative (FLI) is an interactive leadership experience geared to assist Huntingdon College freshmen in reaching their full potential during their college years and beyond. Whether through attendance at seminars on numerous leadership topics, self-management education, freshman forums, etiquette sessions, community service projects, luncheons featuring guest speakers, or off-campus retreats, the Freshman Leadership Initiative exposes participants to the fundamental skills of leadership at Huntingdon College. FLI is for students in their first year at Huntingdon, as well as students who have an interest in being part of Students Government Association (SGA) in their sophomore year. FLI exposes students to what it takes to be a leader on campus and how they can make a difference as a leader at Huntingdon and in their adult lives. Freshman Leadership Initiative events are open to the entire freshman class; however, to receive recognition for the completion of the program, one must apply to be part of the select 30-set group of Initiative participants. Serve in a Leadership Group. In addition to the Student Government Association, each class elects officers for a Class Council.